Dux de Lux comes highly recommended – it’s the ‘author’s choice’ of places to go in the NZ Lonely Planet. It’s a big operation, comprising multiple bars and indoor and outdoor seating areas. It reminded me of the Breakfast Creek Hotel in Brisbane, with one rather significant difference – there’s no red meat on the menu! Dux de Lux serves a large range of vegetarian and seafood dishes, as well as pizzas. They also have a brewery on site and sell a range of half a dozen or so of their own beers. If you like the taste of their drop, check this out as a convenient way to avoid having to queue at the bar: The main meals come with salad and a daily vegetable selection. We both had pan-fried fish of the day cooked in garlic and lemon, with honey soy veg and basil potatoes (about $NZ20 each, and the cheapest seafood option). The food was quite bland all round – there wasn’t any hint of honey or soy on the vegetables and the fish, while perfectly edible, was let down by the absence of fresh herbs. Fortunately we’d ordered a half plate of buffalo wedges to go with it, which at $NZ6 were definitely the best value on the table. On a sunny Saturday in early March, it seemed most of Christcurch passed through the joint. 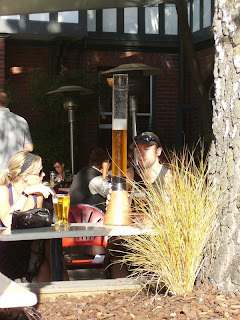 For the atmosphere and the beer, I can see why, but the budget end of the menu was a bit disappointing.